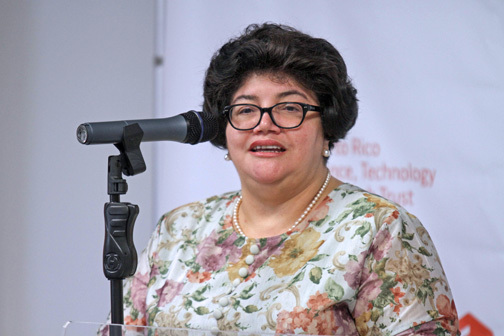 Puerto Rico Science, Technology & Research Trust CEO Lucy Crespo. A group of business organizations in Puerto Rico’s entrepreneurial ecosystem have joined forces to launch “Raise Your Business PR” campaign to support small and medium-sized enterprises (SMEs) of all business sectors to take the necessary actions after the impact of Hurricane María. The initiative includes collecting data on business needs throughout the island, providing guidance on the support resources available and how to access them, as well as the efforts to identify other ways to help revive the business sector. The initiative comprises INprende, Centro para Emprendedores, the Puerto Rico Science, Technology and Research Trust — with its programs Colmena66 and Parallel18 — Grupo Guayacán, Piloto 151, Puerto Rico Chamber of Commerce, Department of Economic Development and Commerce, Compañía de Comercio y Exportación, Foundation for Puerto Rico, ConPRmetidos, Semillero Ventures, Infopáginas and GFR Media, among others. “We want to identify the needs of businesses in Puerto Rico to see how we can help them. To get that information, a form was created that helps us see the impact on the business sector and how recovery can be accelerated,” said Alessandra Correa, founder of INprende. According to the Federal Emergency Management Agency (FEMA), more than 40 percent of companies fail to open after a disaster, and those that do, only 29 percent continue to operate two years after the disaster. “We understand that there are pressing needs for water, food and gasoline in many parts of Puerto Rico, but little by little we have to collect the information that will make us understand how we can achieve that SMEs, which are a source of important employment on the island, stay afloat,” said Lucy Crespo, CEO of the Puerto Rico Science and Research Trust. “This effort is aimed at allowing local entrepreneurs open their businesses as soon as possible, and, if they are already operating, we can guarantee the continuity of their service,” said Nerma Albertorio, director of Centro para Emprendedores. Entrepreneurs with internet access can access bit.ly/LevantaTuNegocioPR and complete the form, or call 787-525-4111. However, taking into account communication challenges as a result of the hurricane, as of this week, brigades from participating organizations will conduct regional visits to collect the necessary data. The first brigades will be in Aguadilla Saturday at Punta Borinquen Resort from 10 a.m. to 3 p.m. The next visit will be to Ponce on Oct. 28. The calendar with meeting points will be updated and aired in social networks and regional radio stations. The brigades visiting the regions will be using a mobile application that will allow them to fill and save the form on their devices even when there is no cellular signal, and update the database automatically once they have access to the internet. The tool was developed by the Unit for Vector Control of the Trust and was updated to support the business ecosystem. Printed materials will also be delivered with information on available aids immediately, the documentation they need to request them and places with internet connection so that they can begin making the arrangements. I am a retired member of management from Abbott Laboratories in Chicago. I am in the process of aligning myself with a charity organization in the States that is focused on supporting the needs of small and medium sized businesses in PR since the Abbott’s and Baxter’s and Walmart’s of the world seem to be bouncing back quickly. Your organization’s mission seems to match perfectly with the volunteer role I am supposed to support when I fly down to Puerto Rico in the next week or so. My planned role is to match businesses’ needs with what is available now in San Juan or can be specifically shipped down. For example, OSHA contacted the charity on Friday, offering face masks and gloves and other safety gear but it didn’t make sense for it to be shipped to PR until there was a need for their donation. No reason to clog the airport and/or ports with unneeded product. I am finally in regular touch with some of my friends in Barceloneta so I understand exactly how challenging things are. Is this a potential partnership that makes sense once I get to Puerto Rico or do you have sufficient support at this time? Either way, my prayers are with all of my friends in Puerto Rico! Hey Buddy!, I found this information for you: "Entrepreneurial orgs unite to help PR businesses". Here is the website link: https://newsismybusiness.com/entrepreneurial-unite-businesses/. Thank you.